I called this quilt block pattern Nine Patch with Logs. The block is a variation of a design that was called simply nine-patch when it was published by Grandma Dexter and others in the early 20th Century. 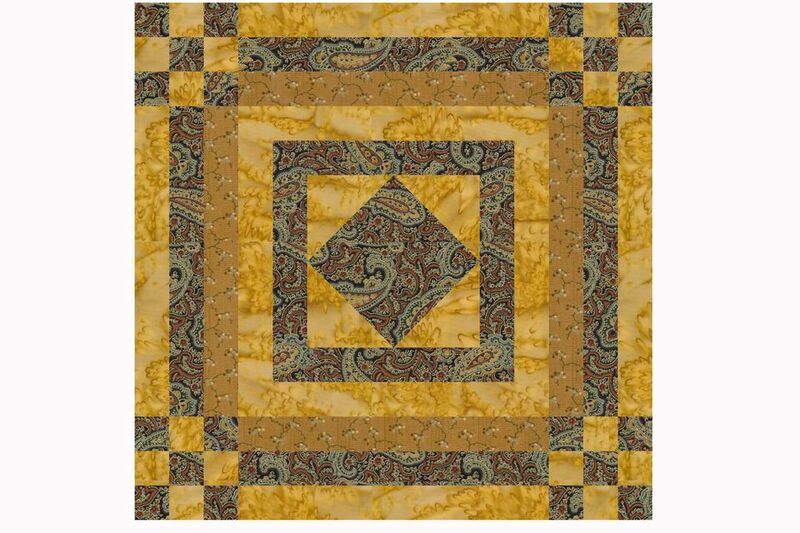 The quilt block finishes at 15" x 15" and is made up of easy quick pieced patchwork. The nine-patch quilt blocks in its corners have 1" (finished) squares and the long strips of fabric that surround the block are 1" wide (finished). Test your quarter inch seam allowance. Press to set seams before you carefully press the seam allowances to one side. Use straight pins to hold fabrics together while sewing. Measure patchwork as you work so that everything fits together just as it should when it's time to assemble the quilt block. Read the entire pattern before you begin. The quilt block is suitable for every type of fabric, from vintage reproductions to contemporary designs. Select any quilting fabrics that appeal to you but do consider print scale. Some large prints are not suitable for narrow strips because they can appear very different from one area to another. That may be fine with you, especially if you decide to make a scrap quilt. The example block is made with just three fabrics -- work with more fabrics if you prefer. Figure 1. Sew a 1-1/2" x 12-1/2" A strip lengthwise to each side of a C strip of the same size. Set the seams and press seam allowances towards the outer strips. The middle strip should measure 1" in width along its entire length. The outer strips should each be 1-1/4" wide. Square up one end of the strip set and cut (8) 1-1/2" segments. Figure 2. Sew a 1-1/2" x 6-1/2" C strip lengthwise to each side of the A strip of the same size. Set the seams and press seam allowances towards the middle. Square up one end and cut (4) 1-1/2" segments. Figure 3. Arrange two Figure 1 segments and one Figure 2 segment into three rows. Sew the rows together, matching seam intersections. Press the seam allowance away from the middle row. Repeat to make a total of four nine-patches. Set aside. Find the 1-1/2" wide A, B, and C strips that were cut from selvage to selvage. Sew the strips together lengthwise, placing the A (darkest) strip in the center. Set the seams and press allowances away from the center. Square up one end of the strip set and cut (4) 9-1/2" segments. Set aside. Make longer strip sets and cut more segments if you plan to make many identical quilt blocks. Work with shorter (but more) strips if you have a difficult time cutting long strips of an accurate width. Read my strip piecing tips for quilters for more information. Chain piecing is always a helpful technique to try when you sew quilt blocks. The quilt block's center is made from a square-in-a-square quilt block surrounded by Fabric A strips and Fabric C strips. Draw a diagonal line from one corner to the opposite corner on the back side of each 3" Fabric C square. Figure 5a. Place a marked square (with the line as shown) in the upper right corner of the 5-1/2" Fabric A square. Sew a seam on the line. Press to set the seam. Figure 5b. Cut through both layers of fabric about 1/4" beyond the sewn line. Figure 5c. Flip the leftover triangle right side up. Press seam allowance either direction. This is the same technique we use to make easy Snowball quilt blocks. Sew another square to the opposite corner (diagonally) and then add the two remaining squares. The new patchwork should measure 5-1/2" x 5-1/2". Press seams either direction for remaining steps. Figure 6. Sew a 1-1/2" x 5-1/2" Fabric A strip to opposite sides of the square--in-a-square block. Press. Sew the 1-1/2" x 7-1/2" Fabric A strips to the remaining two sides of the center block. Press. Repeat, first adding the 1-1/2" x 7-1/2" Fabric C strips to opposite sides and pressing and then sewing the 1-1/2" x 9-1/2" Fabric C strips to the remaining sides and pressing. The patchwork center should measure 9-1/2" x 9-1/2". Arrange patchwork into three rows as illustrated. When positioning the 3-bar segments, make sure that Fabric B is oriented to touch the center patchwork. Connect the patchwork in each row. Set the seams. Press allowances towards the bar units. Join the rows and press. The quilt block should measure 15-1/2" x 15-1/2". If the block is off just a bit try one of my easy ways to fix problem quilt blocks.